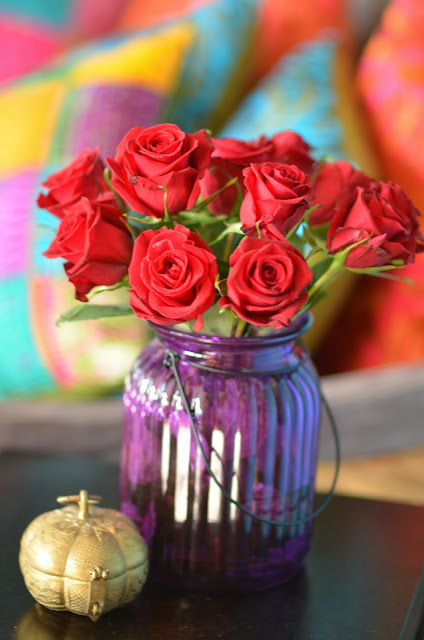 Hello and welcome to the season of joy, color and inspiration! Dasara and Diwali are around the corner and what better way to celebrate than share festive inspirations right here on Aalayam. Supriya and I have channeled our collective enthusiasm to create an array of seasonally appropriate festive posts! And tonight, we kick off! 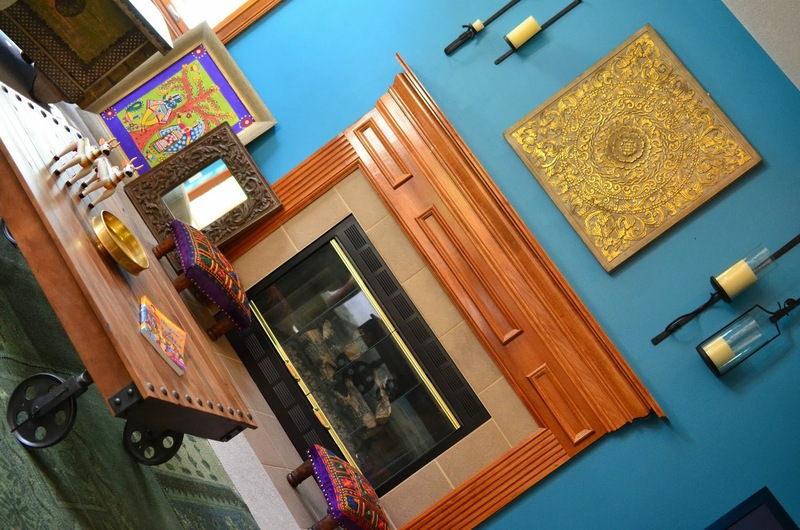 Our first stop- my (Deepa's) colorful family room! If you are thinking of getting into the festive spirit with a few touches to spruce up the main living area of your house then this post might be just what you are looking for! This is also the next stop on my (Deepa's) home tour. I am sure many of you remember previously featured posts on our son's room, guest room and the media room. If not, stop by and take your time! But now - the family room. The family room is truly the heart of our home (that's right, move over kitchen!). It is where we talk, laugh, play and grow. It's the grand central station! But the high-traffic did not deter us from focusing on the aesthetics. I think we (my husband and I) wanted this room to be a comfortable living and visually stunning space. This is where we entertain our guests too. And so, we pushed the envelope! 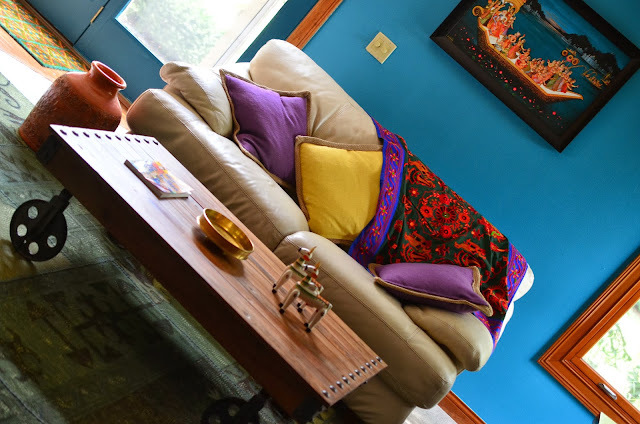 Moving from the unassuming earth tones of our previous home to the bold, Bollywood-like batch of colors in this room- we did a dramatic 360! We embraced color! Bathed in a myriad hues of teal, purple, green, yellow, gold and more this room greets you with a bohemian charm and on closer look you will see traditional Indian accents layered throughout the space. For now, I am happy but any home decor enthusiast will tell you that home decor is never done and therefore, I see it as work in progress. This room has good bones - beautiful architectural details, lots of natural light, tall windows and great views of the back yard. We walked into this room and we were sold on the house! That's how much we loved this space to begin with and therefore, making it our own was not hard. We pictured a fun and inviting space where we could unwind and exchange stories after a hectic day at work and school and that was our inspiration. The resulting nonconformist look was a happy accident ! Not letting any particular style stifle our creativity was a great way to go with this space, i guess. We brought in diverse elements, one at a time, purely guided by our instinct - the distressed coffee table, a BG Sharma painting, artisanal candle holders, a handcrafted wool rug and pillows in vibrant hues came together in layers to create this indulgent look. We joke about it and say that we kept adding pieces till it felt right - one little thing here and one little thing there! Purple predominates as the accent color. How that came to be, I have no idea! I brought the purple embroidered footstools into the family room last winter to enjoy the warmth of the fire and they have remained there since and this may have very well started a cascade of purple accents slowly trickling into the room. Teal wall and purple accents, who would've thought ? But purple adds punch to this space, don't you think? Overall, the space is anchored by investment furniture such as the leather sofa, the media credenza, a large coffee table and a seating bench and that's where the bulk of our budget was consumed. I swear by timeless pieces that are durable, versatile and which can withstand a few dings! We bought the leather sofa about 8 years ago. Not your conventional casual seating, I agree but with the addition of a few colorful pillows, it fits right in! The space is large and open and planning the seating area was easy. We toyed around with accent chairs before settling on this distressed bench. 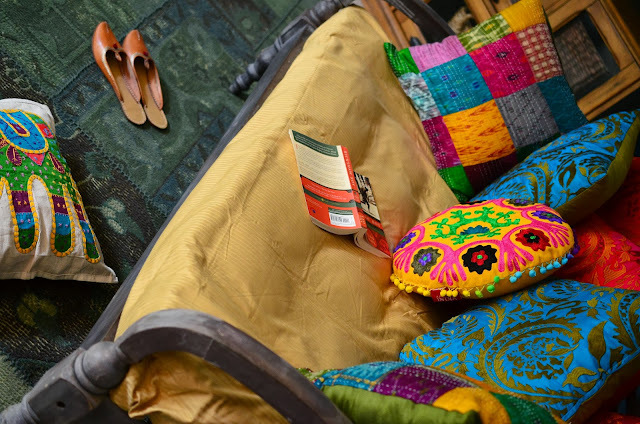 Together with the kantha and embroidered pillows, the bench gives this corner of the room a "haveli-esque" feel and invties conversation. The golden Buddha plaque adds a paradoxical mix of drama and serenity at the same time! I love how decor accessories that we have owned for varying lengths of time seem to blend in harmoniously with their newer contemporaries. 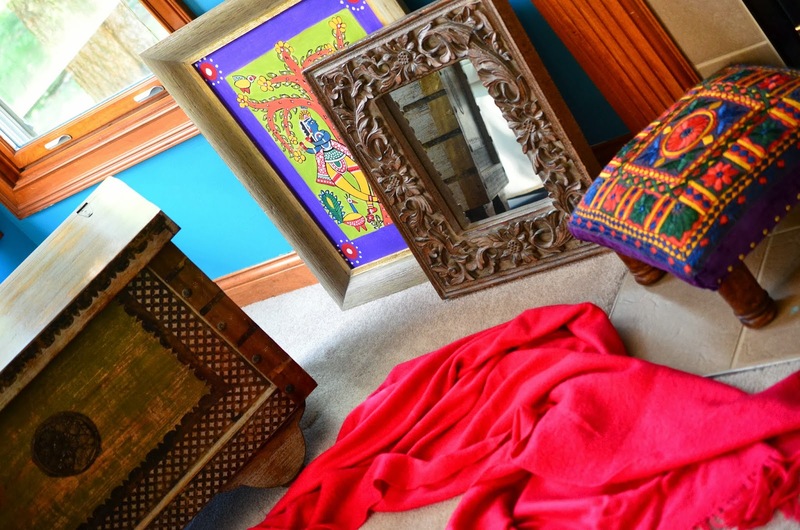 A recent addition- the ornate trunk merrily shares the space with a Madhubani painting (that I painted) and an intricate wood framed mirror that we have owned for 12 years. A happy marriage of the old and the new brings life to this corner. This space works for us functionally and aesthetically because it is filled with things we love and cherish. Indian accessories take center stage and add visual interest to our American home reflecting our multicultural personalities. Our home stands ready to celebrate and make memories this festival season! Home is also a place where we bring to life traditions that make us a family and nurture our spirit. And this Dasara, I am celebrating my first (!) 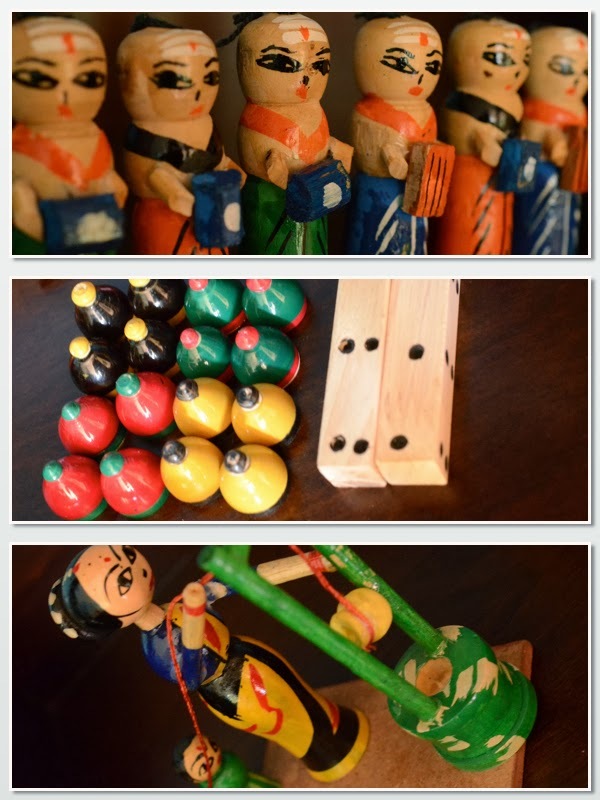 Bombe Habba or Golu and my inspiration ?- Supriya's post on Dasara Bombe Habba from last year! We prepped for our Golu this weekend and my little boy was an enthusiastic little helper! And here is a peak at what our Golu looks like. 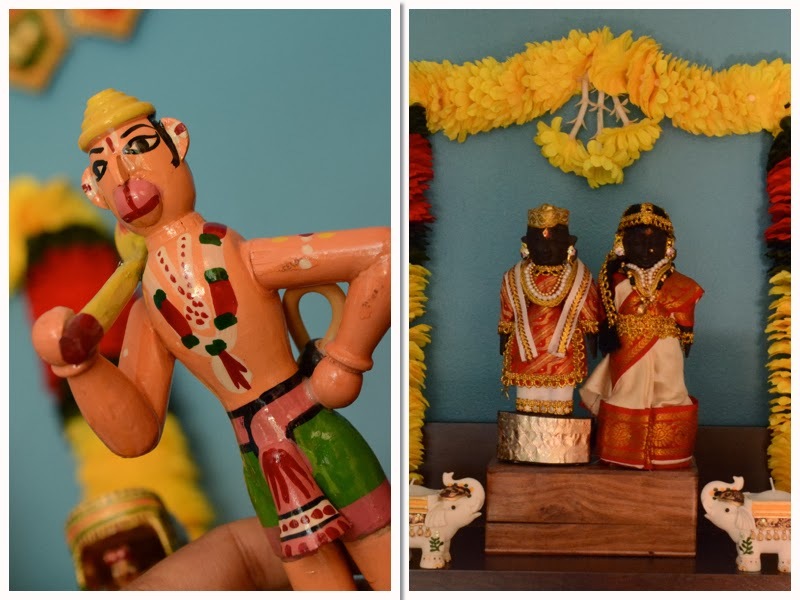 Marapachi dolls (Pattada bombe) and channapatna wood lacquered toys are the highlight of our Golu this year. Its a modest first time effort and I had a lot of fun reading up on technicalities and teaching my boy and I look forward to letting our collection evolve over time. Dear readers, what is your home story? What does the word "home" mean to you? And how does it play into your lives this festive season. Let's have a conversation. Write to us. 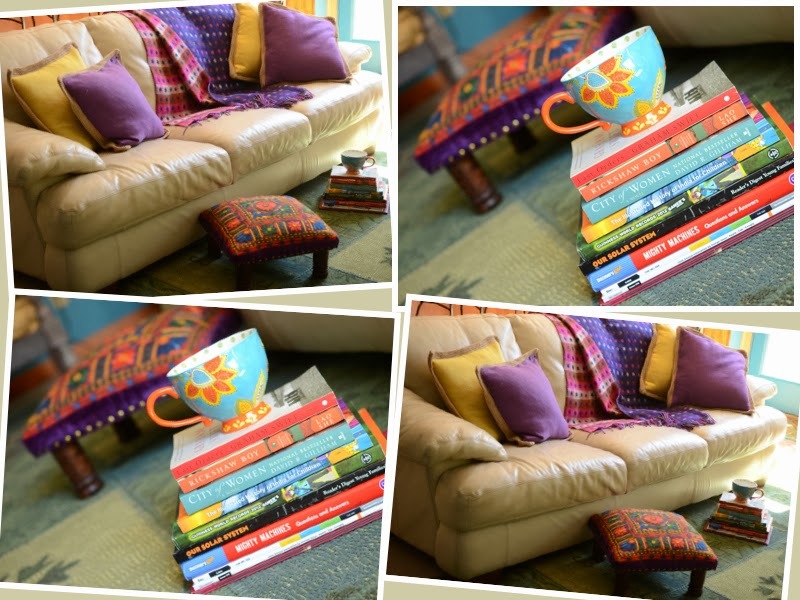 Next up, Supriya tells the story of Dashavathara followed by my post on Diwali decor inspirations - stay with us! P.S: All pictures in this post are from my home and are the copyrighted property of Aalayam. Please ask before using. Vidya: Thank you for your lovely comment. I am not a designer but what I have figured out so far with this designing process is to let your instinct guide you. That usually works - even if the end product is not entirely magazine quality, it is still things that you love and adore! Please tell me more about the pictures- which ones? Are you talking about the angle of the shot or the bokeh effect? The etagere is great! Routinely it holds a lot of my brass antiques and seasonally it serves to showcase festive displays! I am so fond of this ! Loved the way u have displayed golu on a ladder shelf! Thanks Sangitha! For now, the etagere serves this purpose nicely - if i end up with more dolls (gievn my penchant for collecting), i will need something bigger! so are you getting ready for the festive season too- tell us how. Lovely room. I love the marriage of colors. The ladder for golu is delightful. Hope the ladder grows in length and width as the years go by :). We had all neutral walls in my previous home too. So this time around we went bold. We have a rust color in my family room with white trim. I think it looks very warm and inviting. I do have a darker shade of teal/blue in my den. BTW - have the same coffee table in my family room :) . Radhika! was thinking of you today. Was wondering if you will comment on this post :) and also if you are done painting your house? Thanks for responding to my telepathic message! ofcourse :) my husband's already worried about my new found love for Golu - i'll definitely need a bigger ladder in a few years! rust or burnt orange seems to be a popular color - a perfect all season color ! i have to see your house now!! Deepa, Yes I remember. i'm not a good photographer, Have to enlist my husbands help for that. Will soon send you the pics. Love the colour burst in your house. Makes it warm, inspirational and Indian! Please do come back - we have so many more festive posts lined up! Thank you Nayana! And glad that your busy summer is behind you- we've missed you in the blog world! Thank you Anandhi for taking the time to comment. A very happy dussehra to all of you as well! i still remember your apprehensions about the Teal/Blue..now with all the accessories it looks magnificent! Would have loved to see a close up of just the ladder with the bombes. That ladder piece is a great idea by the way.. setting up the steps takes some time! Divya: Yes, the blue was scary at first. Thank you for your compliment. The ladder is a permanent fixture in this room- works well for seasonal displays. First of all, thank you for visiting my blog and leaving me a note and also introducing me to your very amazing blog! I'm glad I'm here (and I've spent quite a lot of time here....). Each and every post is wonderful with a good doze of eye candy. Thanks neha for your kind words.